What is the best possible way to spend my Labor Day weekend? Is it to head on a road trip with friends, to indulge myself in the sun on the beach, or to max out my credit cards at the shopping mall? These things above, I have done them all. However, the happiness that they brought me were short lived; in fact, it disappeared right afterwards. It wasn’t until I started to learn about Chan meditation, that I finally found a way to embrace true happiness. So, that is how I spent my Labor Day weekend this year. Apparently, I was not alone. 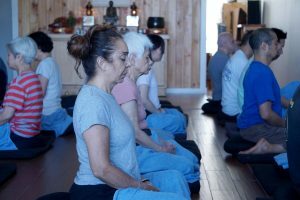 There were more than twenty people who had attended the 3-day Chan meditation retreat at the Chan Meditation Center in Elmhurst, New York. Our lead teacher Ven. Changzhai had mentioned that she was very encouraged to see us willing to join her to practice Chan meditation. Just like every other retreat, I had gained a lot more things this time as well. I don’t remember exactly since when I started enjoying being alone and letting Chan meditations become my favorite activity in life. Chan meditation does indeed make simple life enjoyable. 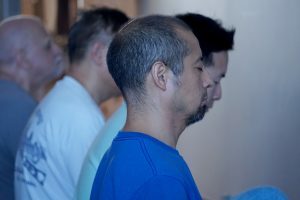 The temporary Chan Meditation Center doesn’t have enough space to accommodate the retreat participators to stay overnight; therefore, they have to go back to their own home after the last sitting session each day during the retreat. Walking home from the subway station, I was able to embrace the breezy wind and enjoy the scents from the flowers by the edge of sidewalks. Unlike during my daily routine, when I’m on the same path, all I can smell is the disgusting garbage and human sweat. 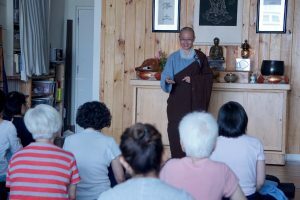 Just like how in the dharma talk session, Master Shengyen, our Shifu, had mentioned: “the mind turns with the environments; environment turns along with mind.” When your mind is peaceful enough, you can perceive a rather not beautiful environment as beautiful and vice versa. Us, ordinary beings, in general, use our vexed mind to deal with things instead of true mind. However, by practicing hard, it is possible for us to improve ourselves towards the ‘true mind or no mind’ direction. What the world is like is created by our mind. 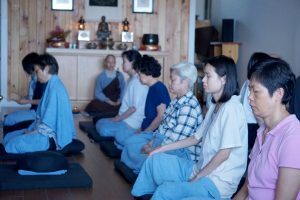 At the Chan Meditation Center, the current space is rather narrow and badly ventilated compared to most of the other meditation centers. Not only that, with simple and basic insulation in the building, the variety of noises from the exterior have absolutely no problem penetrating the exterior walls to disturb us. Shifu, in the dharma talk had mentioned the Konan about Master Huineng, the sixth patriarch. In the story, there are two monks who are arguing about a blowing flag. One argues that it is the wind moving while the other one argues that it is the flag that is moving. Master Huineng, however, said that it is your mind moving. When my mind is moving with the noise, I would pull my mind back to the method and remind myself that it is all from my mind. I believe that because our retreat is rather short, everyone is trying hard to cherish this time to practice. After the walking meditation session on the second day, Ven. Changzhai was happy to see us working hard, and praised us with encouraging and warm words.